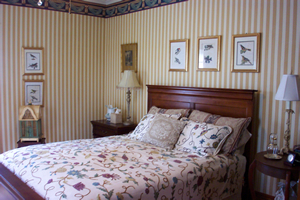 Click the pictures for details of each room. Roses dominate this truly Victorian space, from the Belgian tapestry duvet to the top of the gold-glazed walls. 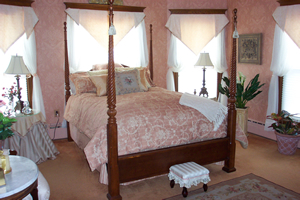 A quiet reading corner and private bath are decorated with period antiques and more roses. A serene space, resplendent with peach damask on walls and bedding, this large room includes a sitting area and private bath en suite. 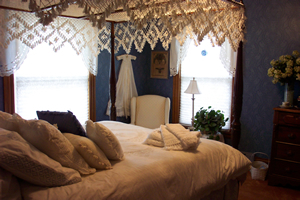 A mahogany canopy bed with a hand-tied macrame canopy dominates this room, which showcases Vintage linens and lace. A collection of 18th century bird lithographs lines the gold and cream striped walls of this room, which overlooks the water garden. 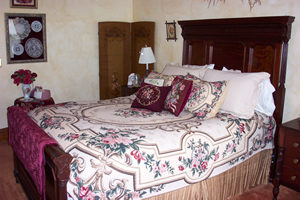 For travelers wanting to share a room and not share a bed, this one fits beautifully with our musical theme. 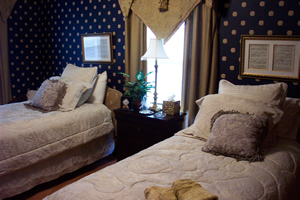 The two largest rooms can accomodate an extra person on a three-quarter roll-away bed. For business travelers, request this if you are staying more than two consecutive weeknights.